Good Morning! Today's Twisted Tuesday Challenge is to use a tree or group of trees on your creation and the twist is to tie some knots on your creation. So, tie up your ribbons, twines, whatever just as long as we can see some knots! It's easier to first cut out the top note layer and then begin your stamping. I decided to use one of my favorite stamp sets Lovely As A Tree. I stamped two tree images using soft suede ink, but I stamped off onto a piece of scrap paper and then I stamped onto my top note layer. For the darker old olive tree I stamped it onto my ink pad and then using my soft suede marker I colored the tree trunk. My background is embossed using the vintage wallpaper embossing folder. The designer series paper on my background was ran through my paper crimper. My top note layer is placed onto my card using dimensionals. I decided to add three small pieces of ribbon tied with knots in the upper right hand corner and my sentiment is from a retired SU stamp set called Whimsical words. I almost forgot to mention that I cut out a top note layer using old olive card stock and I ended up cutting that in half and I placed it just a tad bigger than my white top note layer. I wanted it to look like there was an old olive layer behind my main image panel. This is fantastic. I really like the ribbon touch. Your other one posted today is great too. I had better get to CASE stamping today. This is gorgeous... so pretty! Love the colors and layout on this card. Great ideas! 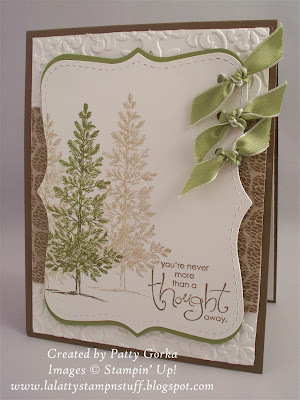 Lovely as a Tree is one of my fav nature stamps and so versatile. Love, love, love what you've done with this and your darling knotted ribbons on the side. Wonderful! Love the combination of the BG with the focal panel...and these colours together.